The last time I personally witnessed Marillion live was back in the eighties in the Fish-era, and at the height of their commercial success. Despite Steve Hogarth having joined 27 years ago, I have never seen them live until now in 2016 in Manchester. 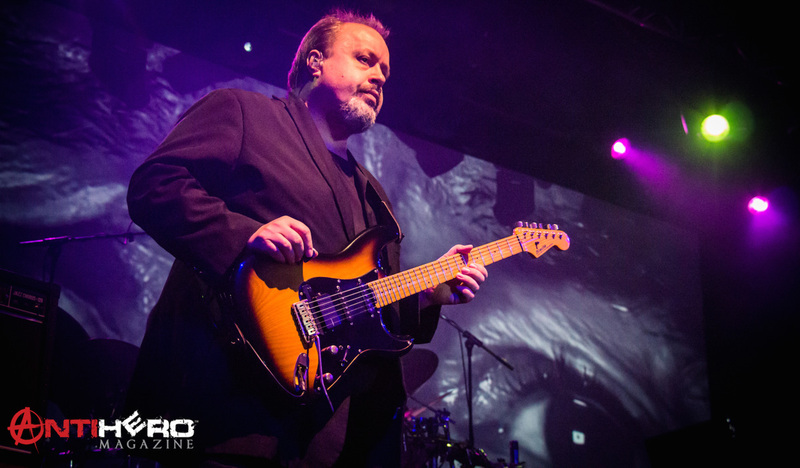 I had the chance to chat to guitarist, Steve Rothery, prior to the band’s soundcheck. I opened by congratulating Steve on the success of the band’s latest album, F.E.A.R. I asked him if the band had been surprised by its impact and its subsequent high global chart success. Thank you, I think that we knew that we had made a great album. You never really know how it is going to be accepted. The reviews all around the world have been the best that we have had in many, many years. The chart position in the UK is the highest in twenty-nine years. Yeah, you never really know. There is a difference between creating something that you are proud of and having any expectation of it being successful. I felt quite early on that it was going to be a special record but I didn’t foresee it being so well received. The thing is we kind of exist outside of the conventional music industry and that is usually how things proceed with us. We write and record a new album, and it is released and pretty much ignored by most of the media. In this case, we have had such an incredibly positive response. Five Star Review in the Guardian (high-end UK paper), everywhere around the world it seems that the press has taken to it. Maybe it’s a message and its relevance to the state of the world, I think that it is probably an album of its time [and that] could have been part of the reason that it has been so well received. How has the songwriting process changed within the band between your two vocalists? Well, in the early years, the Fish years, I used to write most of the music. That started to change after Steve joined. For the last few albums we tended to write by jamming. We get together in a room, improvise around ideas and record everything. Our producer Mike Hunter listens through and mixes down the best of the ideas to a private Soundcloud account that we all then listen to and pick our favourites. They become the building blocks for the songs. At the same time, Steve is singing; he has a laptop open with all his lyrics on and if we play something that he finds inspiring he will sing a certain lyric on it. Sometimes you can fit several pieces of very music together with the same lyric. Occasionally, you will combine them within the same song, or you can choose which one seems to fit the best. I suppose when Mike Hunter is listening to it, it’s a lot easier when you have lyrics with a piece of music – it’s halfway to being a song, as opposed to a great instrumental section. There are both, I think, on this record. Do you find it harder to write a melodic song or an aggressive song? Or is there no difference? Well, we don’t set out with any preconceived ideas of what is going to come out. It is just whatever comes out in the room at the time. Because we write so many ideas, you can make so many different albums just from the raw material. We have never had this with three very long tracks on an album before, for example. That was just how these songs evolved, each song has a natural evolution. That is kind of just what we do, we follow wherever the music takes us, I suppose. What, therefore, do your solo albums offer you creatively that Marillion does not? At the end of the day you are writing by committee with a band and we get on well and we have a fantastic creative chemistry. Like you say, there are so many different creative directions that you could take each album. When you have a solo album, you have a chance to say, “this is how I would do it,” because you are not having to do that writing by committee. It’s quicker and a little more satisfying creatively. It challenges you a bit more, I think, to try and get it together to make a whole album of music. At the same time, it gives you an opportunity to experiment and not work by committee. Following the Marillion tour you will be playing some solo tour dates in January. The tour is called “Ghosts and Garden Parties.” I am assuming that sheds some light on the selection of material that you will be playing? It is kind of trying to describe to people the emphasis really, because it is a set of two halves. The first half we play an instrumental set from the “Ghosts” album, which is great fun to do. It is a certain kind of thing and then in the second half I play some of the older Marillion songs that we never play any more with Martin Jakubski, from Still Marillion, joining me on vocals. That is kind of like a celebration of the history of the band, of the songs that we haven’t really played with Steve Hogarth. Some of them that we haven’t played that many times. It just becomes a bit of a party then with the two halves of the set. It’s great fun. How do you view the Marillion legacy? As being of two halves or just a natural evolution? Yeah, I think that it is an evolution. Obviously, when you change, like Fish leaving, people’s perception is that, “oh, it’s the end of the band.” Because I had always written, as I said, most of the music and Fish never really wrote any music, I felt strongly when he left that there was still a strong identity for the band to continue. I think that we have improved over the years as writers, but what I feel that I am most proud of is the consistency. This is our eighteenth album, how many artists can you think of that can make an album this strong so far into their career? Most would have retired. Apart from the change of vocalist the same core elements remain. Exactly, but we always experiment and try to push ourselves with each album to keep it fresh and interesting. In a way, we make the music for ourselves, and we hope that the people will like it. It’s the only way that you can do it, and still enjoy it. You have spent a major part of your live touring and being on the road. Do you feel more at home being on the road than off it? It’s difficult, I like being at home too with my family and it’s nice to sleep in your own bed. There is a freedom from responsibility that you have when you are on the road. You don’t have to do the mundane stuff like cutting the grass, paying the bills, and doing the shopping. Your focus is completely on playing the music and you almost have to become someone else to do that really. It’s like playing a role. It’s great fun, and you can make great friends and have a great time. At the same time it takes a price out of you in terms of your liver, your sanity, and quite often your marriage or your relationships. It’s always a balancing act really between doing what you love to do and not getting lost within people’s perception of you when you do that. At the end of the day we are all getting on, we are all in our late fifties and early sixties. Who knows how many more years that we can do this. I think that touring is a young man’s game and once you get past your late thirties, early forties, it starts to get harder. Like last night on the tour bus, we drove up from our show in Aylesbury, and you don’t sleep properly on a tour bus. When you are young you can just get past that but as you get older you just want a good night’s sleep. It’s not so much physically demanding in that it demands concentration. Really, two hours, sometimes two and a quarter hours, of complete and utter focus and concentration to give your absolute best every night. You can’t always give your best because every night can’t be the best night of your life, but you do what you can and give the audience what you feel that they deserve in terms of performance. In the first period of the band’s history there was a consistency in terms of album artwork through Mark Wilkinson. Had there ever been any thought of doing something similar with the second part of Marillion; i.e., by using a single artist to design all the artwork for the bands releases? We tend to change with each album’s artwork. A Spanish artist, and then we would go back to more design-type stuff on the last two albums. When you get a feeling of the sort of album that you are making, then that’s really when the ideas start to come as to what you want to portray visually. We have nothing set in stone so that will probably continue to change as the albums (hopefully) continue. How then do you transfer the album visuals into the live show in terms of stage production, lighting, effects, etc.? What is different about this tour is that we are using a lot of projections. So, that has to be incorporated into the design and when it comes down actually to the choice of venues you need to have the height for the screen to go up. You can make those choices. We comment and make changes to the videos as we see fit until we are happy with them. We have a great lighting zoner, in fact one of the best. You come to a point where you pass responsibility for that aspect on to someone whose job it is. How does that work out when the band regularly change their set lists? We mainly change it when there are two concerts geographically close. Then you know that there will be a high percentage of people travelling so then you would maybe change four or five songs in the set. Just so that it makes it different. Looking back at your career and the experience and wisdom that you have achieved would there be any advice that you would have given your younger self just starting out? I think that when you are a young band you just want to be a musician, make records and tour. You have no idea or understanding of the mechanics of the industry that you are in. There is a lot of people that will exploit you along the way. You finish up that the people that make the money are the management, the record companies, even your agents. They take stuff off the top, and whatever is left – the crumbs are thrown to the bands. I look back and our most successful years when we had gold and platinum albums and were selling out stadium tours. The amount of money that we made was pitiful. We make more money now than we did then. That is because everyone had their own slice of the pie and, as I said, you end up with the crumbs. So, you get burned and then you have to develop a better business sense? You do, yeah. It’s a shame you have to put on your business man hat, really. When we sacked our manager, John Arnestin, I kind of made it my mission to understand the industry a bit more. I read about it, there are a couple of really good books. One by an American attorney called, Donald S Passman, and another by a record producer. This was to get a real understanding of the industry that I had already been working in for nineteen years. That kind of informed our choices a bit after that. We booked our first tour by ourselves, and that kind of led us to here to be self-sufficient in this great situation. Outside music itself, I understand that you have a keen interest in photography? That is probably my only main passion. I have a book for sale at the merch stand at the shows, “Postcards from the Road.” This is the first of three volumes of my photographic diaries, which has been very well received. I have just brought out a limited edition – 3000 copies of it. It’s like a coffee table book, really. That is coming out as an app as well sometime in the next few months. We are just finalising that. Reading, cinema, I used to do a lot of track driving. Expensive hobbies really. Final question, Steve Rothery, who would you personally like to interview? Perhaps a personal icon or inspiration? That is a difficult one to say, actually, probably Kate Bush. She is an artist that I admire greatly, but other people would be like, Joni Mitchell, Neil Finn. Great song-writers really.